Merrell Agility Peak Flex - To Buy or Not in Apr 2019? Merrell is an American footwear company that has a primary focus on hiking boots but also branches out into running shoes and stylish athletic shoes. They are known for their high quality, and many of their shoes are very solid for rougher terrains. 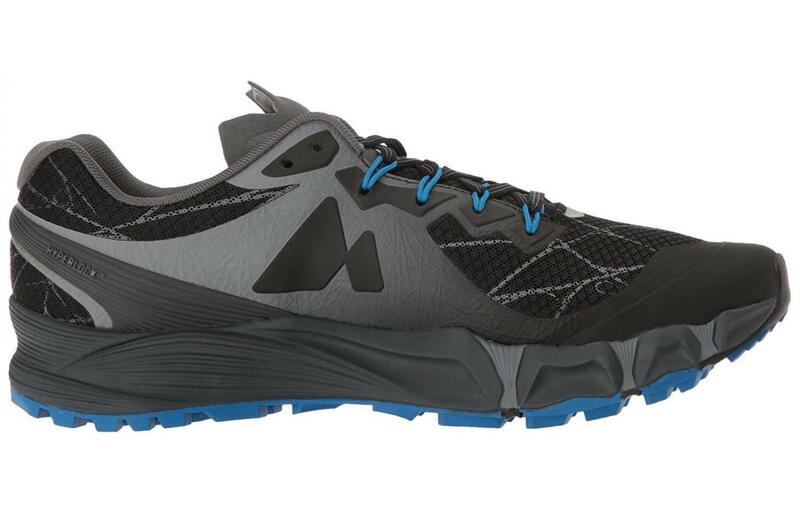 The Agility Peak Flex is one of their trail running shoes that has a bit more of an emphasis on flexibility and comfort than many others in this category. This review will take a look inside the different features offered by the shoe. The outsole of the Agility Peak Flex is a special type of outsole known as an aggressive outsole. This term is used to describe lugs on outsoles that stick out more than traditional lugs. The lugs on the Agility Peak Flex extend 4 mm past the bottom of the shoe. Their purpose is to help with climbing and traction on uneven areas. This is particularly good for trails, where this will come into play more often. These lugs also make use of Merrell’s Grip+ system, which has a special geometry to ensure appropriate traction throughout the entire outsole, even in wet conditions. These lugs are made of a special rubber blend that is also designed to be durable, to increase the lifespan of the shoe. Overall, the outsole of this shoe is pretty effective in fulfilling its role and unique to boot. The Agility Peak Flex’s midsole is made up mostly of EVA foam. EVA is a very solid and standard choice for midsoles, thanks to its springiness, lightweight, and ability to retain its original shape after impacts. 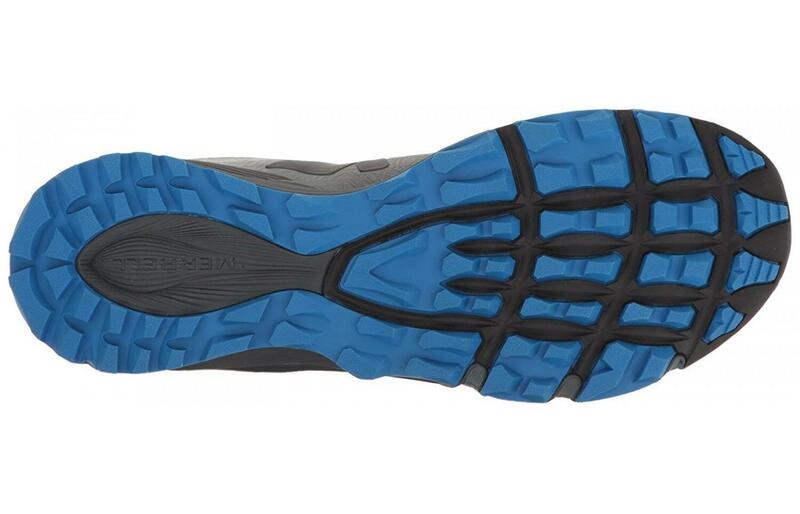 The midsole uses EVA foam in tandem with Merrell’s FlexConnect technology, which is supposed to help balance and stabilize the feet while running. Apart from this, the midsole doesn’t really have any other major features. As a whole, the midsole is decent, though fairly standard, and a bit lacking in features that make it stand out. The main design of the Agility Peak Flex’s upper is mesh. Mesh is a great choice for uppers as it is both breathable and flexible inherently, thanks to the way that it is woven. Additionally, the upper features TPU, or thermoplastic-urethane, essentially plastic. This is placed outside of the upper, in order to help prevent, dirt, debris, and mud from getting into the shoe, which can frequently happen on trails. The upper also contains a special lacing system called Omni Fit. This system helps to keep the tongue in the appropriate place and prevent it from sliding or getting stuck in uncomfortable positions. Within the upper is a footbed made of EVA foam, that can be removed. This is a nice touch for a little extra cushion underneath the foot. Merrell also uses some unique materials and design within the upper to help reduce odor and bacteria build up. Finally, the upper features reflective materials to help increase visibility and safety at night. 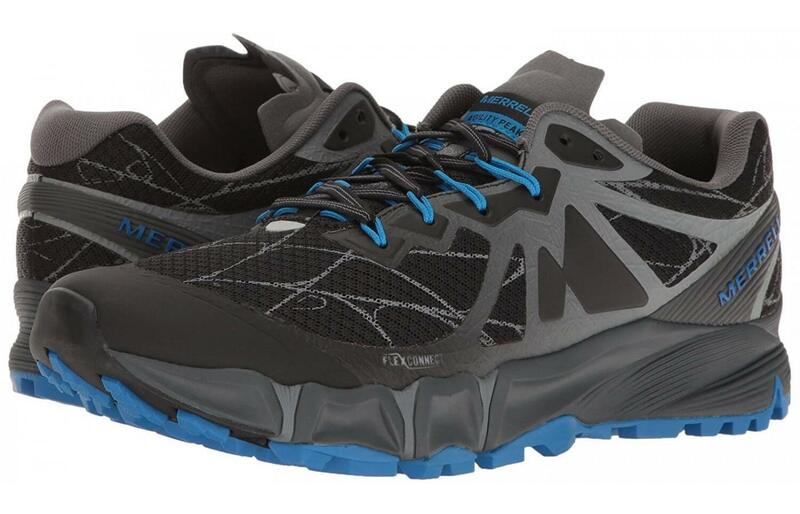 The Merrell Agility Peak Flex is not particularly light, weighing in at around 11 ounces. This is pretty good for a trail or off road shoe actually, as they generally tend to favor higher weights due to being thicker and more cushioned. The weight of the Peak Flex is pretty decent, though not super impressive or significant by any major stretch. Those that prefer more lightweight shoes might find this a bit too heavy however. Breathability is pretty good in the Peak Flex thanks mostly to the upper. Because the upper is mesh, it allows air to move in and out of it quite well, as the mesh is woven with intentional holes. One limiting factor is the TPU cover. While the cover helps with preventing mud and debris from getting into the shoe, it also does limit some of the breathability, due to it being on the upper. Despite the only real component of breathability being the mesh upper, the Peak Flex still is pretty decent in this regard. Comfort is fairly strong in the Merrell Agility Peak Flex, due to the combined factors in the upper, midsole, and outsole. The upper is comfortable thanks to the mesh, which allows for good movement and flexibility. 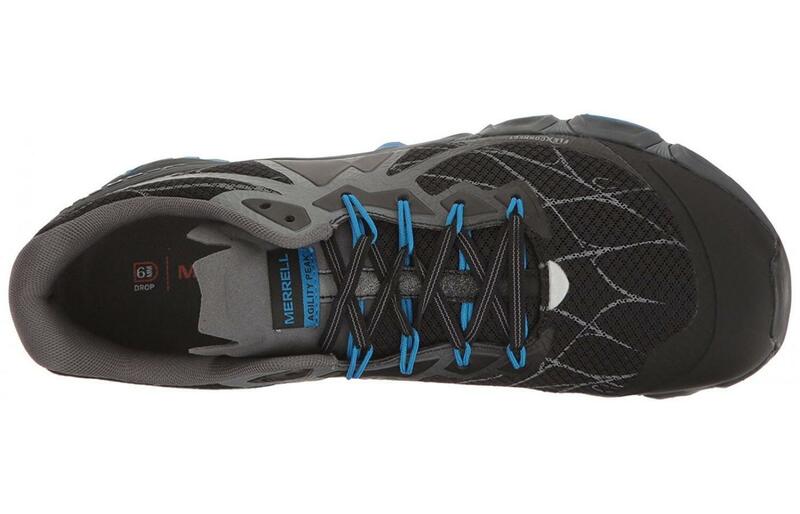 The upper also helps with Merrell’s Comfort Fit system, which helps to stabilize the stride. Finally, the liner within the upper adds a bit of cushion and helps prevent sweat build up. The midsole contributes via the EVA foam, which cushions and reduces impacts while running. This combines with the previously mentioned FlexConnect technology, which helps as well. Finally, the outsole helps with the lugs, which increase traction, making for a more stable stride. As a whole, comfort is pretty good in the Peak Flex thanks to these features. 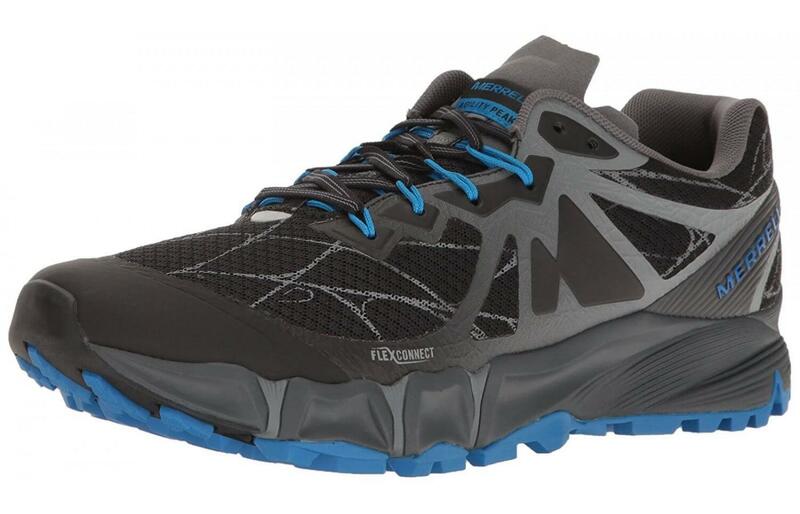 Merrell shoes have a bit of a different look and style to them compared to other trail shoes. They have a more athletic shoe look, rather than a tough, trail running shoe exterior. Reviewers feel the Agility Peak Flex is a pretty good looking shoe. It has a web-like design, featuring a pretty big range of accent colors to choose from. Though the Peak Flex is good looking, one might see trouble using it as an everyday shoe. Durability is pretty solid in the Agility Peak Flex. The main pieces that add to this are the upper, outsole, and midsole. The upper is great thanks to the mesh. Mesh is generally more durable than synthetic uppers, because it is made in one piece and doesn’t risk tearing in the connected areas. The outsole’s durability comes via the rubber material used in the lugs. This material is pretty good at resisting impacts over long periods, which makes it pretty long lasting. Finally, the midsole comes in with the EVA foam. EVA is an inherently durable material, and it keeps its original springiness and shape even after many miles. This allows the shoe to still provide proper cushioning and reduce impacts over its lifespan. Durability is pretty good in the Peak Flex thanks to the combination of these factors. Protection is decently good in the Peak Flex, though it could definitely have benefited from some extra cushioning. The midsole and upper are the main pieces of protection. The midsole’s protection is from the EVA foam. As mentioned above, this foam reduces the shocks from impacts and strides, which helps prevent damage to the feet and legs. The uppers protection comes from the TPU layer on the outside. This layer prevents dirt, debris, and mud from getting into the shoe, which is nice for keeping the inside clean. Though these features do a pretty good job at providing protection, a bit more cushion might be nice, considering that the shoe is meant for off-road more than city running. A rock plate, or perhaps just an extra layer of EVA foam might have made sense. Overall though, the Peak Flex is still pretty good in terms of its protection of the feet though. Responsiveness is usually dependent on the midsole and is decent, but not great in the Agility Peak Flex. The midsole of this shoe uses EVA foam. EVA is pretty good at returning energy, and it is very lightweight as well, making a pretty responsive midsole. The added traction from the lugs on the outsole also helps with this, by making more effective and efficient strides. These two factors are nice, but they are also pretty standard features on many shoes. The Peak Flex could definitely do more to differentiate itself from other shoes when it comes to responsiveness, but it isn’t horrible by any stretch. Support in the Agility Peak Flex stems mostly from the upper and the midsole. The upper adds support thanks to the upper, which helps to secure the foot with its mesh design. The mesh helps with support by allowing the feet to flex properly with good range of motion. The liner in the upper also helps with support a bit, with the tiny bit of EVA foam under the feet. The midsole adds to support mainly through its EVA foam as well. The foam supports the feet from underneath and also reduces shocks and impacts. Finally, the FlexConnect technology in the midsole also helps to support by stabilizing the feet and keeping strides straight. The Peak Flex is actually a bit more suited to off road terrains than most shoes. The main reason for this is the special lug design employed by the outsole. These lugs fare very well on dirt and on inclines, but are a bit overkill for city terrains where traction is usually adequate already. That said, the shoes should still function perfectly fine, and barring the most extreme of terrains, the Peak Flex should see no major issues. Price for the Agility Peak Flex is not really a strong suit or a weak suit. The shoe falls pretty much in the average to slightly above average range for trainers. For those seeking a budget shoe, this is probably a bit too high of a price, but for those seeking a mid priced shoe, the Peak Flex pretty much fits that range. Traction is quite good in the Peak Flex, thanks again to the aggressive outsole, with its numerous lugs. As mentioned before, these lugs help to grip onto all kinds of surfaces, at all kinds of inclines as well, and allow for a good and stable stride. The Grip+ system also employed by the outsole helps with traction as well. This system uses a specific geometry that enables the shoe to make contact with the ground in a better way that promotes more traction and efficiency. Overall, the Peak Flex should not have any problems with traction, again, barring more extreme terrains where specialized shoes are needed. Flexibility in the Peak Flex mainly comes from the upper and the midsole. The upper’s main stake in flexibility is through its mesh design. As touched upon above, the mesh design is quite good at allowing free range of movement, thanks to the fact that it is woven, rather than being a solid construction. This allows the top half of the foot to twist as needed, making for a flexible environment overall. The midsole contributes a bit less, but still provides flexibility through the EVA midsole. EVA is a pretty flexible material in its own right, and in this case it allows the feet to strike the ground in a variety of ways while still returning energy well. Stability throughout the Peak Flex is mostly a factor of the upper and midsole as well. The snug design of the upper plays a role here. It allows the foot to move around comfortably thanks to the flexibility of the mesh, but it still securely holds the foot in place. The overall effect of this is a very stable upper, that secures the foot while not limiting its movement. The midsole adds to stability by protecting from shocks and impacts with the EVA foam, making for a smoother and less inconsistent stride. The drop on the Peak Flex is about 6mm. This is a bit lower than expected of a trail shoe but overall is not too exceptional in any way. The drop of this shoe isn’t really a major factor in the shoes effectiveness. The Merrell Agility Peak Flex is a pretty solid shoe for those seeking a light trail shoe, or an mid-priced shoe that can also double for hiking and other activities. For those that will focus more on city running, the Peak Flex is still usable, but probably not the best choice. The price of the shoe is right around the average, so it is not too much of a commitment, except for those who would prefer a budget shoe.